Magnesium is an important ion in reef aquaria. Like calcium and alkalinity, it can be depleted by various means if appropriate measures are not taken to maintain it. In order to prevent its depletion, or to correct a deficit when it occurs, magnesium supplements are often used. These supplements can, however, be fairly expensive, and this article describes how to make your own magnesium supplements out of inexpensive materials available to the public. Magnesium's primary importance in reef aquaria is its interaction with the calcium and alkalinity balance. Seawater and reef aquarium water are always supersaturated with calcium carbonate. That is, the solution's calcium and carbonate levels exceed the amount that the water can hold at equilibrium. How can that be? Magnesium is a big part of the answer. Whenever calcium carbonate begins to precipitate, magnesium binds to the calcium carbonate crystals' growing surface. The magnesium effectively clogs the crystals' surface so that they no longer look like calcium carbonate, making them unable to attract more calcium and carbonate, so the precipitation stops. Without the magnesium, the abiotic (i.e. non-biological) precipitation of calcium carbonate would likely increase enough to prohibit the maintenance of calcium and alkalinity at natural levels. For this reason, I suggest targeting the natural seawater concentration of magnesium: ~1285 ppm. For practical purposes, 1250-1350 ppm is fine, and levels slightly outside that range (1200-1400 ppm) also are likely acceptable. However, an aquarium's corals and coralline algae can deplete magnesium by incorporating it into their growing calcium carbonate skeletons. Many methods of supplementing calcium and alkalinity may not deliver enough magnesium to maintain it at a normal level. Settled limewater (kalkwasser), in particular, is quite deficient in magnesium, but so are many commercial materials sold for use in calcium carbonate/carbon dioxide (CaCO3/CO2) reactors. Consequently, magnesium should be measured occasionally, particularly if the aquarium's calcium and alkalinity levels seem difficult to maintain, or if there is excessive abiotic precipitation of calcium carbonate on objects such as heaters and pumps. If the magnesium level is found to be low, aquarists can choose from a variety of commercial magnesium additives, or they can use one of the DIY recipes described in this article. The early sections of this article provide a background on magnesium and explain why it becomes depleted. Later sections describe the DIY recipes and show what impact they have on the ionic balance in a reef aquarium over time. Magnesium is the third most abundant ion in seawater, behind sodium and chloride. It is also intimately involved in a great many biological processes in every living organism. Nevertheless, the situation that usually brings it to most reef aquarists' attention is when it is suspected of causing a problem with maintaining appropriate calcium and alkalinity levels. In full strength seawater (salinity = 35 PSU (= ppt)), magnesium is present at approximately 1285 ppm. Magnesium is about five times more abundant than calcium on a per ion basis. Magnesium is significantly lighter than calcium, so when compared on a weight basis, it is only about three times as concentrated (1285 ppm vs. 420 ppm). The magnesium content of seawater has not been constant since the oceans formed. Specifically, the magnesium content has often been lower than it is now, as in the late Cretaceous period. As discussed below, the amount of magnesium getting into calcium carbonate skeletons is a function of how much magnesium is in the water. Consequently, the magnesium content of ancient sediments can be significantly lower than more modern ones from similar organisms. This fact may affect the suitability of certain limestone deposits for maintaining magnesium in aquaria, for example, when such limestone is used in CaCO3/CO2 reactors. Magnesium is present in seawater as the Mg++ ion, meaning that it carries two positive charges, just as calcium does. That, along with the fact that they have many other chemical properties in common, is why calcium and magnesium often displace each other in solid materials, such as coral skeletons made of calcium carbonate with magnesium incorporated into them in place of calcium. Most of the magnesium in seawater is present as the free ion, with only water molecules attached to it. It is estimated that each magnesium ion has approximately eight water molecules tightly bound to it. That is, water molecules that are so tightly bound that they move with the magnesium ion as it moves through the bulk of the water. For comparison, singly charged ions such as sodium have only three or four tightly bound water molecules. A small portion (about 10%) of the magnesium is present as a soluble ion pair with sulfate (MgSO4), and much smaller portions are paired with bicarbonate (MgHCO3+), carbonate (MgCO3), fluoride (MgF+), borate (MgB(OH)4+) and hydroxide (MgOH+). While these ion pairs comprise only a small portion of the total magnesium concentration, they can dominate the chemistry of these other ions. An extended discussion of these facts is beyond the scope of this article, but it should be noted that these ion pairs can have huge impacts on seawater's chemistry. In the case of carbonate, for example, the ion pairing to magnesium so stabilizes the carbonate that it is present in far higher concentrations than it would be in the absence of magnesium. This effect, in turn, makes seawater a much better buffer in the pH range of 8.0-8.5 than it otherwise would be. Without this ion pairing, seawater's pH might be significantly higher and more susceptible to diurnal (daily) swings. The average residence time for a magnesium ion in seawater is on the order of tens of millions of years. That time is substantially longer than that of calcium (a few million years) and aluminum (100 years), but less than sodium (about 250 million years). In a certain sense, this is an indication of how reactive magnesium is: it stays in seawater a long time because it's fairly unreactive, but it does get taken out of solution through various biological and chemical processes more readily than does sodium. Another interesting characteristic of ions is whether they are excluded from organisms, actively taken up or just "allowed" to be present. Like two other common ions, sodium and sulfate, the magnesium concentration in organisms is approximately the same as in seawater (not counting magnesium in skeletons). This probably results from the facts that plenty of magnesium is present in seawater, and that it is used by organisms for many purposes. Chloride, another very common ion, is actively rejected by organisms, and most other ions are substantially concentrated. 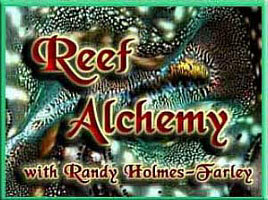 How does magnesium impact the balance of calcium and alkalinity in reef aquaria? Answering this question requires a basic understanding of the calcium and carbonate systems in seawater. I have detailed these in both complex mathematical ways, and in intuitive, simplified ways. In short, calcium carbonate (CaCO3) is supersaturated in seawater, meaning that given enough time calcium ions will interact with carbonate ions and precipitate as calcium carbonate. If the concentration of either ion is pushed too high, CaCO3 will start to precipitate. Magnesium interferes with this process, permitting both calcium and carbonate to be elevated above their level in the absence of magnesium. How does magnesium interfere with the precipitation of CaCO3? The primary way involves magnesium "poisoning" the growing CaCO3 crystals' surface, thereby slowing the precipitation. It can, in fact, be slowed to the point where it simply does not happen at rates problematic to an aquarist. In short, while magnesium carbonate is not supersaturated in seawater (or in typical reef aquaria), and will not precipitate on its own, magnesium is attracted to calcium carbonate surfaces where the carbonate ions are already held in place by the calcium ions. With the carbonate ions held in place, magnesium finds it an attractive place to bind. After a short time in seawater, a virgin calcium carbonate surface quickly obtains a thin coating of Mg/CaCO3 (magnesian calcite) as magnesium pushes its way into, and onto, the crystal's surface. Eventually, the surface contains a substantial amount of magnesium. The extent to which this occurs depends on the underlying mineral and is apparently much more extensive on calcite than aragonite. It also depends upon the water's relative amounts of calcium and magnesium. Regardless, a new type of material is formed that contains both calcium and magnesium. This new mineral surface containing both calcium and magnesium is not a good nucleating site for the precipitation of additional calcium carbonate (as either aragonite or calcite), so the precipitation of additional CaCO3 slows down substantially. The importance for aquarists is that if the magnesium concentration is too low, it may not adequately play this role. In that situation, pumps and heaters (and any warm object) may get coated with precipitating calcium carbonate. Further, that precipitation removes calcium and alkalinity from the aquarium, making it harder to maintain adequately high levels of these two parameters. In terms of the amount of magnesium consumed, the primary sink for magnesium in reef aquaria is calcification. When calcium carbonate skeletons are deposited, magnesium often gets into them in place of calcium. It is not entirely clear whether this is something that organisms "try" to control or not. Nevertheless, the amount of magnesium entering the skeletons of different organisms varies greatly. The amount of magnesium incorporated into the skeletons of various calcifying organisms varies considerably. In a previous article I showed that corals in the ocean can incorporate between about 0.1% and 3.5% magnesium by weight in their skeletons (Table 1). Coralline algae also incorporates a considerable amount, typically more than 1%, and as high as 4.4%, by weight. Few data are available on coral skeletons in aquaria, but their magnesium content is not expected to differ significantly from the same organisms living in the ocean. In addition to the magnesium used in the process of calcification, many (if not all) organisms take it up directly from seawater. Organisms ranging from bacteria8-10 to fish11 take up magnesium, but the amount is generally much smaller than that used during calcification. In many cases, there is so much magnesium in seawater that the organisms expend more effort pumping excess magnesium back out than they do trying to take it up. Calcium is present in the coral skeletons described in Table 1 at about 35 - 38% by weight, because they are largely calcium carbonate. Consequently, the Mg/Ca ratio ranges from about 0.0025 to 0.12 by weight in corals. Consequently, for a calcium supplement to be the sole source of magnesium in an aquarium, it would have to include approximately this same Mg/Ca ratio (0.0025 to 0.12) to preclude magnesium's buildup or depletion over time. Obviously, with such a wide range, the exact balance in any given aquarium will be determined in part by the mix of corals and coralline algae being maintained. Fortunately, there is such a large reservoir of magnesium in seawater that it takes large differences between import and export to cause important changes in magnesium levels. In order to understand what happens over time to magnesium levels in an aquarium using an additive that adds little or no magnesium, such as limewater, or a DIY two-part system without the magnesium portion, I have developed some simple models. This model assumes that no magnesium is lost due to any process except calcification, and that no magnesium is added. 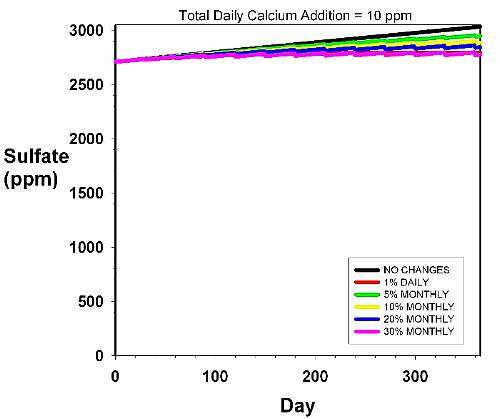 This model also assumes that magnesium is removed from the aquarium as a co-precipitate with calcium carbonate at an average level of 1% magnesium by weight (a Mg/Ca ratio of about 0.025). An aquarium with a heavy load of organisms that use more magnesium, like coralline algae, may show a larger depletion of magnesium. Table 2 shows what happens to magnesium over time when the aquarium is supplemented daily with 4, 8 and 16 ppm calcium and 0.2, 0.4 or 0.8 meq/L (0.6, 1.1, or 2.2 dKH) alkalinity. For comparison, this dosage is equivalent to 0.5, 1 and 2% of the tank's volume daily in saturated limewater. In previous articles I have used published data to show how magnesium and strontium might become depleted over time in aquaria using calcium carbonate/carbon dioxide reactors. Table 3 shows the relative concentrations of calcium and magnesium in these different systems. The various reactor media vary somewhat in their ability to maintain magnesium if it is depleted at a Mg/Ca ratio of about 0.0025 to 0.12. Because these media are somewhat deficient in magnesium, it's anticipated that they will result in a long-term depletion of magnesium, although not as rapidly as when no magnesium is supplied (Table 2). It has been suggested that adding dolomite to CaCO3/CO2 reactors can help with magnesium problems. Dolomite is a material that contains both magnesium and calcium carbonate. If dolomite is added to the reactor to maintain existing appropriate magnesium levels against their continual depletion via calcification (for example, if the calcium carbonate used is too low in magnesium to maintain adequate magnesium), then this is a fine approach. Aquarists might typically use on the order of 10% of the media as dolomite (and 90% as calcium carbonate). Consequently, raising magnesium in this way by 100 ppm will necessarily raise the alkalinity by 8.2 meq/L (23 dKH). The only way around this problem is to add a mineral acid (not vinegar) to the aquarium to reduce the alkalinity, and that may be more problematic than just adding a magnesium supplement in the first place. Very few studies have examined the toxicity of elevated or depleted magnesium to most marine organisms. In large part this circumstance likely stems from the fact that magnesium in the ocean would almost never be greatly increased or decreased in concentration, aside from effects stemming only from salinity changes. I have summarized what little seems to be known in a previous article. The obvious primary source of magnesium in marine aquaria is the artificial or natural seawater used to set up the aquarium, and with which any water changes are performed. Some artificial salt mixes have been reported to be deficient in magnesium, while others have been reported to have a substantial excess. Dissolution of calcium carbonate substrates containing magnesium may provide a small amount of magnesium to a typical reef aquarium, but not enough to maintain adequate levels since such dissolution is fairly slow (normally not enough to maintain adequate calcium or alkalinity levels either). Another potential source of magnesium is fish food. Magnesium is present in many foods at fairly high concentrations, but not enough to significantly impact typical magnesium levels (~1285 ppm). The effect of foods over the course of a year has been estimated to be a boost of about 1-14 ppm magnesium. The primary sink for magnesium in reef aquaria is co-precipitation with calcium carbonate (i.e., calcification). This occurs in organisms, as shown in Table 1, and also during the abiotic (i.e., non-biologically driven) precipitation of calcium carbonate (such as on heaters and pumps). A potential sink that has been described by some hobbyists is the precipitation of magnesium by limewater (kalkwasser). Both magnesium hydroxide and magnesium carbonate have been suggested as sinks for magnesium. I do not believe that either is an important process in most aquaria. Adding any high pH additive, including limewater, results in the transient formation of magnesium hydroxide. This material quickly redissolves upon mixing such that the local pH drops below about 8.6.-9.0. Magnesium carbonate is a more complicated issue, as it is near its solubility limit in seawater and may quickly get coated with less soluble magnesium calcite. These issues have been dealt with in a previous article of mine as well as one by Bingman, and the conclusion in both cases is that neither of these precipitates likely is a long-term sink for magnesium in most reef aquaria. A variety of commercial magnesium supplements are available. Those supplements made by ESV and Kent are quite popular, although I've seen no detailed analyses of them. Assuming they are what they claim to be, they are fine products to use, even for obtaining large increases in magnesium levels in reef aquaria. I've used the ESV supplement, along with ones that I've made myself. I would not suggest raising magnesium by more than 100 ppm per day, in case the magnesium supplement contains impurities. If the magnesium level needs to be raised by several hundred ppm, spreading the addition over several days will allow you to more accurately reach the target concentration, and might allow the aquarium to handle any impurities that the supplement contains. One thing to keep in mind about magnesium supplements, including the DIY recipe given below, is that they are all necessarily quite "dilute" even when presented as dry solids. The reason for this is that magnesium is a doubly-charged and very light ion. So in salt form, or when dissolved in a liquid, it is necessarily attended by a large number of quite heavy counterions (chloride and sulfate, usually). Commercial dry supplements may be only 8% magnesium by weight, for example. There is just no way around that. Compounding this issue is the simple fact that there is so much magnesium in an aquarium that significant supplementation requires a great deal of material. A 100-gallon aquarium contains about a pound of magnesium! Raising that same aquarium's magnesium level by 200 ppm would require the addition of on the order of two pounds of dry magnesium salts! The goal of any do-it-yourself (DIY) recipe should be to allow safe and inexpensive supplementation without negatively impacting the seawater's chemistry. Aquarists can select either of two main materials to make such supplements, and three recipes are appropriate to make from these materials. 1. Epsom salts (USP grade magnesium sulfate heptahydrate) is readily available in drug stores and is fairly inexpensive. The problem is that if this were used to raise magnesium by a large amount (or a small amount several times) the aquarium water would become enriched in sulfate. This enrichment may not be a problem for some aquaria, especially those using salt mixes already deficient in sulfate, or those that employ frequent water changes. Nevertheless, Epsom salts alone is not an ideal magnesium supplement. Table 4 shows the effect on an aquarium's sulfate level over time of using only Epsom salts to supplement magnesium, and when no water changes are employed. Clearly, the sulfate rises quite substantially over time. Figures 1-6 show the effect graphically with different water change amounts including 0%, 10%, 20% and 30% monthly, and 1% daily. In these cases, sulfate rises, but water changes can help mitigate the rise. If at least 30% is changed monthly, or 1% daily, using Epsom salts alone as a magnesium supplement may be acceptable; otherwise the sulfate buildup is likely too large to be optimal. Table 4. Sulfate Rise Over the Course of a Year When Using Magnesium Sulfate to Supplement All Magnesium. Figure 1. 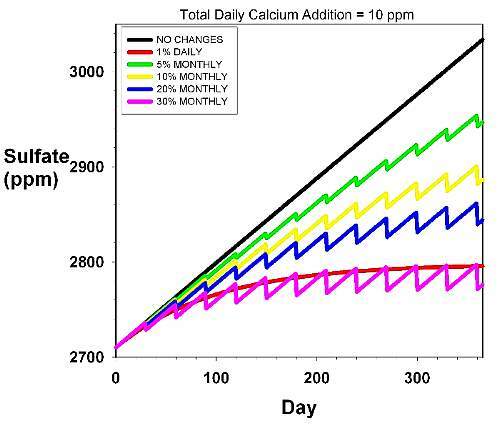 The rise in sulfate over time in an aquarium with a daily dosage rate of 10 ppm calcium and 0.5 meq/L (1.4 dKH) alkalinity. This dosage rate is typical of an average mixed reef aquarium. Magnesium is assumed to be supplied by using Epsom salts alone. The various curves reflect different water changes scenarios, including none (black), 5% monthly (green), 10% monthly (yellow), 20% monthly (blue), 30% monthly (pink) and 1% daily (red). Figure 2. An expanded version of Figure 1, shown to provide a more accurate assessment of the relative rise of sulfate over the background concentration (2,710 ppm). 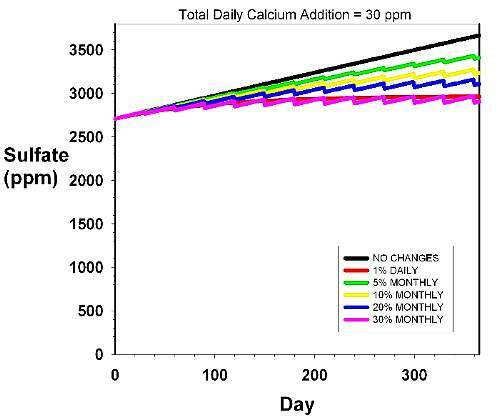 The rise in sulfate over time in an aquarium with a daily dosage rate of 10 ppm calcium and 0.5 meq/L (1.4 dKH) alkalinity. Magnesium is assumed to be supplied by using Epsom salts alone. The various curves reflect different water changes scenarios, including none (black), 5% monthly (green), 10% monthly (yellow), 20% monthly (blue), 30% monthly (pink) and 1% daily (red). Figure 3. The rise in sulfate over time in an aquarium with a daily dosage rate of 20 ppm calcium and 1.0 meq/L (2.8 dKH) alkalinity. This dosage rate is typical of a reef aquarium with a medium to high calcification rate. Magnesium is assumed to be supplied by using Epsom salts alone. The various curves reflect different water changes scenarios, including none (black), 5% monthly (green), 10% monthly (yellow), 20% monthly (blue), 30% monthly (pink) and 1% daily (red). Figure 4. An expanded version of Figure 1, shown to provide a more accurate assessment of the relative rise of sulfate over the background concentration (2,710 ppm). 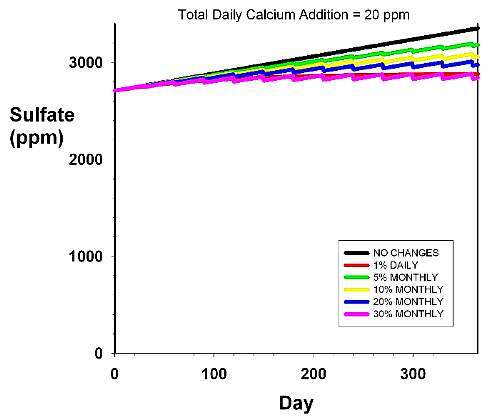 The rise in sulfate over time in an aquarium with a daily dosage rate of 20 ppm calcium and 1.0 meq/L (2.8 dKH) alkalinity. Magnesium is assumed to be supplied by using Epsom salts alone. The various curves reflect different water changes scenarios, including none (black), 5% monthly (green), 10% monthly (yellow), 20% monthly (blue), 30% monthly (pink) and 1% daily (red). Figure 5. 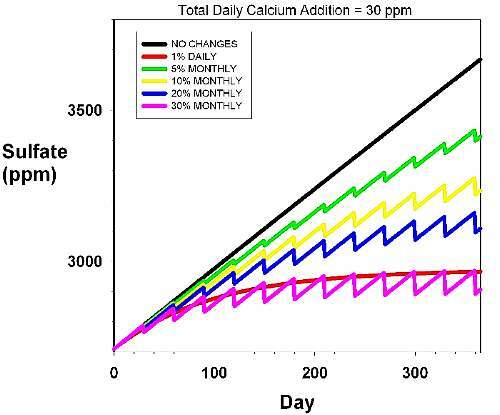 The rise in sulfate over time in an aquarium with a daily dosage rate of 30 ppm calcium and 1.5 meq/L (4.2 dKH) alkalinity. This dosage rate is typical of an small polyped stony coral-dominated aquarium with a high calcification rate. Magnesium is assumed to be supplied by using Epsom salts alone. The various curves reflect different water changes scenarios, including none (black), 5% monthly (green), 10% monthly (yellow), 20% monthly (blue), 30% monthly (pink) and 1% daily (red). Figure 6. An expanded version of Figure 1, shown to provide a more accurate assessment of the relative rise of sulfate over the background concentration (2,710 ppm). 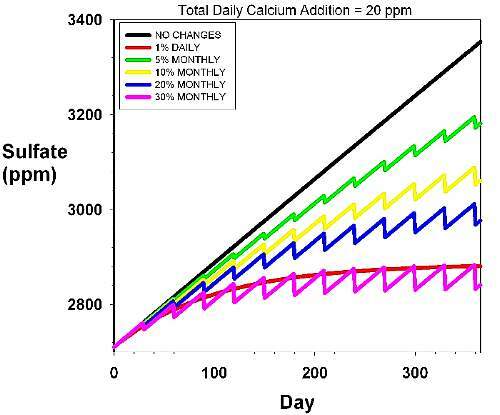 The rise in sulfate over time in an aquarium with a daily dosage rate of 30 ppm calcium and 1.5 meq/L (4.2 dKH) alkalinity. Magnesium is assumed to be supplied by using Epsom salts alone. The various curves reflect different water changes scenarios, including none (black), 5% monthly (green), 10% monthly (yellow), 20% monthly (blue), 30% monthly (pink) and 1% daily (red). It's also possible to determine the effect on sulfate from one-time boosts to magnesium using Epsom salts. Epsom salts actually contain about four times as much sulfate as magnesium, so boosting magnesium gives an even larger boost to sulfate. Table 5 shows the effect on sulfate of several different increases in the magnesium level. From that table, it is clear that boosting magnesium by 100 ppm or more using Epsom salts has a substantial effect on the sulfate level. I therefore do not recommend using this method to boost magnesium by more than about 50-100 ppm. Every subsequent addition will compound the effect, although water changes will serve to reduce it over time. Table 5. Sulfate Increase from a Single Magnesium Boost Using Magnesium Sulfate. 2. A second DIY material is magnesium chloride. Some grades of magnesium chloride traditionally have been contaminated in ways that would preclude their use in aquarium applications. They sometimes contain ammonia, for example. So any random magnesium chloride brand that's selected may not be acceptable. However, magnesium chloride hexahydrate from the Dead Sea Works seems to be adequately pure for this purpose. It is sold as a deicer (MAG flake from hardware stores, for example) or as a dust control agent for equestrian arenas. Editors note (3/10/07): Note, the manufacturer of MAG flake has alerted us that they very strongly recommend against using this product in reef aquaria. While many reef aquarists have successfully used the product, the manufacturer does not claim to be able to provide this product at suitable quality in the future. As an alternative source of magnesium chloride, some aquarists have begun to use Nigari, a Japanese product derived from seawater that is used to manufacture tofu. It appears to be mostly magnesium salts of chloride and sulfate, but how much sulfate and how much chloride, as well as what other metals it contains, remains to be demonstrated. The recipes here will focus on MAG flake, but if you want to experiment, substituting Nigari for MAG flake may be acceptable. When used as a supplement to boost magnesium, magnesium chloride will slowly boost the chloride level, but because chloride is present in seawater at more than 19,000 ppm naturally, a small boost is seldom important. Table 6 shows the rise in chloride concentration over time using this supplement. The chloride rises a bit over a year, but not enough to become a concern. This rise is much smaller than the reported typical variations between salt mixes (more than 1000 ppm chloride). Any water changes will further mitigate this increase. I use this material to boost the new artificial seawater that I use (Instant Ocean) by 150 ppm magnesium. Table 6. Chloride Rise Over the Course of a Year When Using Magnesium Chloride to Supplement All Magnesium. We can also see the effect on chloride of one-time boosts to magnesium when using magnesium chloride. Magnesium chloride actually contains about three times as much chloride as magnesium, so boosting magnesium gives an even larger boost to chloride. Still, the natural chloride level is so high that the effects are small on a percentage basis. Table 7 shows the effect on chloride of several different boosts to the magnesium level. That table clearly shows that boosting magnesium by even 300 ppm using magnesium chloride does not cause a substantial swing in chloride. When corrected for the boost in salinity, the effect is even smaller. Table 7. Chloride Rise From a Single Magnesium Boost Using Magnesium Chloride. 3. A certain mixture of magnesium chloride and magnesium sulfate has no net effect on seawater's major anions (chloride and sulfate). All that is necessary for such a recipe is to add these two ingredients in such a ratio that they add chloride and sulfate in the ratio naturally present in seawater (which is 7.1 to 1 on a weight basis and 9.6 to 1 on a per ion basis). To perfect such a recipe, it's imperative to know the amounts of sulfate in Epsom salts (39%), the amount of chloride in magnesium chloride hexahydrate (34.9%), and their bulk densities, because most aquarists will use a volume based measurement (1.05 g/cm3 for Epsom salts and 0.85 g/cm3 for magnesium chloride hexahydrate solids). Taking all these factors into account, the desired volume ratio is 10:1, MAG flake to Epsom salts, as a supplement; for instance, 10 cups MAG flake and 1 cup Epsom salts. The easiest way to use these supplements is to first make a solution in freshwater. Any of the three different recipes may be chosen, but the second and third are most useful for most aquarists. 1. Using Epsom salts only, dissolve 8 cups Epsom salts in one gallon of water, and use that to supplement magnesium in amounts determined by using this linked online calculator, with the entry "Randy's Recipes 1 and 2 Versions A and B," and ignore for this purpose what those designations mean. This recipe is the least preferred of the three, but can be acceptable if used for small amounts of supplementation, or if combined with at least 30% water changes per month. It is also a more reasonable choice if calcium chloride and sodium bicarbonate (baking soda) are used in large amounts to supplement calcium and alkalinity. 2. Using MAG flake only, dissolve 8 cups magnesium chloride hexahydrate in one gallon of water, and use that to supplement magnesium in amounts determined using this linked online calculator, with the entry "Randy's Recipes 1 and 2 Versions A and B," and ignore for this purpose what those designations mean. This recipe is adequate, but not quite as balanced as #3 below. This choice is not a good way to go if calcium is supplemented by calcium chloride, because together they will force chloride excessively high. 3. Using both Epsom salts and MAG flake, dissolve 7¼ cups MAG flake and ¾ cup Epsom salts in one gallon of water, and use that to supplement magnesium in amounts determined using this linked online calculator, with the entry "Randy's Recipes 1 and 2 Versions A and B," and ignore for this purpose what those designations mean. This recipe is preferred, but its advantage over recipe #2 is minimal in most cases. Note that combining the two materials in solution can result in some precipitation of calcium sulfate (calcium and sulfate are impurities in the MAG flake and the Epsom salts, respectively. To assure yourself that the two materials have fully dissolved, dissolve each separately in some freshwater before combining them. Some calcium sulfate precipitation is acceptable, and it is okay to let the solids get into the aquarium, assuming you can dose in a way that prevents them from landing on delicate organisms. Note also that this recipe (#3) is different from that given in my DIY two-part recipe, because in that case more magnesium sulfate is necessary to offset the rise in chloride that is provided by both the calcium chloride and the magnesium chloride. Whatever supplement you choose, I suggest targeting the natural seawater concentration: 1285 ppm. When first using a DIY recipe, or even a commercial supplement, add a much smaller dose the first time to be sure there is no impurity (such as ammonia) that will negatively impact corals. If you see negative effects, such as corals withdrawing their polyps right after adding it, discontinue its use. If you need to raise magnesium by several hundred ppm, splitting the addition over several days will allow you to better home in on the target concentration, and might allow the aquarium to deal with impurities that come in with the supplement. Magnesium is an important ion for reef aquarists to understand and monitor. In addition to its many biological functions, it serves to prevent the excessive precipitation of calcium carbonate from aquarium water. Unfortunately, magnesium often is depleted from reef aquaria as calcification incorporates it into calcium carbonate skeletons and precipitates. Because many ways of supplementing calcium and alkalinity do not adequately supply magnesium to balance this consumption, other means must be found. Commercial additives, such as those from ESV and Kent, are adequate, but aquarists can also use DIY materials that usually can be obtained at a lower cost. Some of these recipes (and even some commercial supplements) may skew the aquarium's ionic balance over time. Using Epsom salts alone, for example, can cause sulfate to rise. While the exact effects of elevated sulfate have not been clearly established, it presents unnatural ionic chemistry to the aquarium's inhabitants. A recipe using magnesium chloride alone or, better yet, a combination of magnesium chloride and Epsom salts, can produce a DIY recipe that is adequately ionically balanced, easy to obtain and easy to use. 1. Low-magnesium calcite produced by coralline algae in seawater of Late Cretaceous composition. Stanley, Steven M.; Ries, Justin B.; Hardie, Lawrence A. Morton K. Blaustein Department of Earth and Planetary Sciences, The Johns Hopkins University, Baltimore, MD, USA. Proceedings of the National Academy of Sciences of the United States of America (2002), 99(24), 15323-15326. 2. New data on the relation between the magnesium content of reef-forming corals and their systematic location and stages of growth. Pozdnyakova, L. A.; Krasnov, E. V. Inst. Biol. Morya, Vladivostok, USSR. Doklady Akademii Nauk SSSR (1981), 260(3), 739-40 [Paleontol.]. 3. Magnesium content of calcite in carapaces of benthic marine Ostracoda. Cadot, H. Meade, Jr.; Kaesler, Roger L. Harris Cent. Conserv. Educ., Hancock, NH, USA. University of Kansas Paleontological Contributions, Papers (1977), 87 23 pp. 4. Assessment of calcareous alga, Corallina pilulifera, as elemental provider. Yan, Xiaojun. Institute of Oceanology, Chinese Academy of Sciences, Tsingtao, Peop. Rep. China. Biomass and Bioenergy (1999), 16(5), 357-360. 5. Calcium and magnesium carbonate concentrations in different growth regions of gorgonians. Velimirov, B.; Boehm, E. L. Dep. Zool., Univ. Cape Town, Rondebosch, S. Afr. Marine Biology (Berlin, Germany) (1976), 35(3), 269-75. 6. Biochemistry of the coral. IX. Inorganic composition of the skeleton of the coral. Hosoi, Keizo. Sendai, Japan. Science Repts. Tohoku Univ. (1947), 18 85-7. 7. Oxygen and carbon isotopic composition of carbonates deposited by red algae in the middle Adriatic. Dolenec, Tadej; Herlec, Uros; Pezdic, Joze. Fakulteta za Naravoslovje in Tehnologijo, Univerza v Ljubljani, Ljubljana, Slovenia. Rudarsko-Metalurski Zbornik (1995), Volume Date 1994, 41(3-4), 193-202. 8. The marine bacteria. II. The specificity of mineral requirements of marine bacteria. Hidaka, Tomio. Univ. Kagoshima, Japan. Kagoshima Daigaku Suisangakubu Kiyo (1965), 14 127-80. 9. Nutrition and metabolism of marine bacteria. II. The relation of sea water to the growth of marine bacteria. MacLeod, Robert A.; Onofrey, E. Pacific Fisheries Exptl. Sta., Vancouver, BC, Can. Journal of Bacteriology (1956), 71 661-7. 10. Nutrition and metabolism of marine bacteria. I. Survey of nutritional requirements. MacLeod, Robert A.; Onofrey, Eva; Norris, Margaret E. Pacific Fisheries Expt. Sta., Vancouver, BC, Journal of Bacteriology (1954), 68 680-6. 11. Epithelial transport of magnesium in the kidney of fish. Beyenbach K W; Freire C A; Kinne R K; Kinne-Saffran E Section of Physiology, VRT 826, Cornell University, Ithaca, N.Y. 14853 Mineral and Electrolyte Metabolism (1993), 19(4-5), 241-9.